Evett’s story is a true testament to inspiration and encouragement, and that story is the all important catalyst for her great desire to help others realize their higher potential. By every statistic, Evett should not have ended up where she is today. The 10th pregnancy of her mother, three died before her, and Evett was the sixth child delivered and the only one born in a hospital. She was given the nickname Bunnie because she was born premature. Growing up with humble means on an island in north Florida, her father was a fisherman by trade and was away from home a lot. When she was a baby, her family survived a severe car accident with Evett being thrown from the vehicle. After that, her life was about to change even more. When Evett was ten years old, her mother died of a blood disorder, leaving Evett to be raised by her loving and strict aunt. Though memories are hazy, she does remember the love, faith, and kindness her mother instilled in her, a message and blessing that carries Evett through to this day. Evett’s aunt was a single mom and caregiver, working two jobs outside the home. They were poor, but remarkably, Evett didn’t know it. The impact of all she went through as a young child was the beginning of her truest calling and being grounded in faith. She was about eight years old the first time she spoke in church, reading a poem she had memorized. By junior high, Evett was already teaching Sunday school, a sign of days to come in her many speaking engagements and poetry recitations presented as an adult. With fierce determination, Evett worked her way through college, graduating from Florida Southern College (FSC), and she put herself through law school at Mercer University School of Law in Macon, Georgia, plus she received an Honorary Degree of Doctor of Laws from Suffolk University in Boston, Massachusetts. Evett serves on the Board of Trustees at FSC and in 2013, they named the Multicultural Center after her in recognition of her accomplishments and service. Evett’s life’s mission is strong and clear. To give back, the way her aunt did for her. To believe in the basic goodness of people, and demonstrate that in a world filled with challenges and pain, love can prevail. To believe that we must love God and treat others as we desire to be treated. To expand on the gifts that God has given us, and the desire to see our youth learn the importance of faith, family, and friends. To communicate values that improve the spirit, mind, and body of those with whom we connect. Through her writing and inspirational speaking, Evett finds her best self, helping others be comfortable in their lives and knowing the importance of God in all things. Evett’s life story is one for the books and she has written several that share her history in a positive and uplifting way, including children’s books and a poetry book. To bring Evett’s story to life, book her to speak at your next event or conference. Evett’s professional career could fill a book. As an estate, guardianship and elder law attorney, she is shareholder and Chief Diversity Officer of Greenspoon Marder, a law firm with offices in Florida, Nevada, New York, Colorado, and California and close to 200 lawyers on staff. Evett is past president of the National Bar Association (NBA), is a fellow at the American Bar Foundation, and is also a member of the American Law Institute. For over 15 years, Evett worked with the NBA Crump Law Camp for high school students in Washington, DC, including running the annual Evett L. Simmons Mock Trial Competition. Her contributions to the American Bar Association (ABA) have included chairing the Presidential Advisory Council on Diversity, serving on the Board of the Diversity Center, serving in the ABA House of Delegates, and serving as a member of the ABA National Civics Commission on Civic Education. Evett served on The Florida Bar Board of Governors and was the first woman appointed by The Florida Bar to the Judicial Qualifications Commission. Evett is currently serving for the second time as Chair of The Florida Bar Continuing Legal Education Committee, and is past President of the Port St. Lucie Bar Association and the Florida Chapter of the National Bar Association. 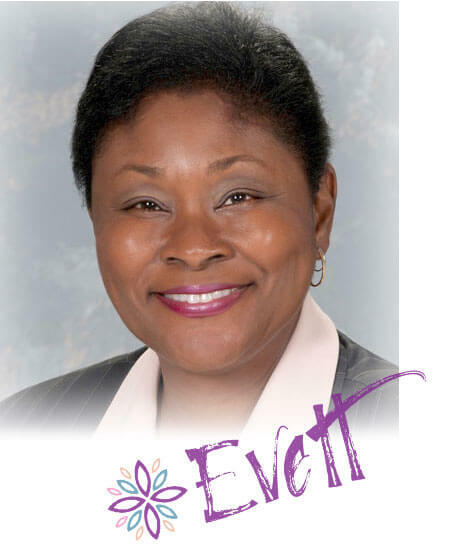 Evett has been on many Boards, including PACE Center for Girls, the United Way of St. Lucie County and the St. Lucie County Chamber of Commerce. She is a member of Phi Mu Fraternity, Omicron Delta Kappa, and Phi Alpha Delta. She was President of the Fort Pierce Alumnae Chapter Delta Sigma Theta Sorority, Inc. and continues her work as Vice Chair of Staff and Parish for First United Methodist Church of Port St. Lucie, Florida. Evett is a lifelong member of the NAACP. Sankofa Award for Contributions to the Legal Pipeline. INDUCTED INTO THE FERNANDINA BEACH HIGH SCHOOL HALL OF FAME INAUGURAL CLASS.